Feminist icon Gloria Steinem and two Nobel Peace Prize laureates have joined a group of 30 women activists planning to cross the demilitarized zone (DMZ) between North and South Koreas in a symbolic step for peace. Steinem, 81, agreed to join at the invitation of Korean-American peace activist Christine Ahn. Nobel Peace Prize laureates Mairead Maguire and Leymah Gbowee have also joined the group. Maguire received her prize in 1976 as one of the founders of Women for Peace in Northern Ireland. Gbowee was recognized in 2011 for helping end the second Liberian civil war. 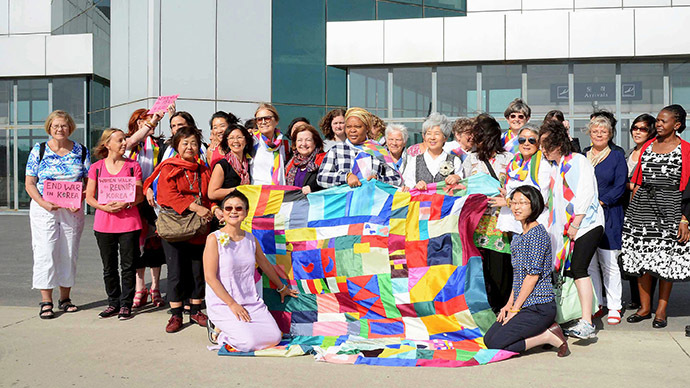 Women Cross DMZ announced that the historic crossing would take place on May 24, celebrated by the activists as International Women’s Day for Peace and Disarmament. Initially, the activists planned to cross the boundary at Panmunjom, where the 1953 armistice was signed. Due to South Korean opposition, the crossing was moved to Kaesong. According to the organizer, the plan is to start the crossing in the company of North Korean women at the Reunification Monument in Pyongyang, cross at Kaesong, hold a peace ceremony at Panmunjom, and then return to Kaesong to cross the demilitarized zone, known as the DMZ. “For those who can go to that evil [North Korean leader Kim Jong-un] and smile to his face speaking of ‘peace, peace...’ They apparently aren’t [sic] thinking about the abused and oppressed people of the Country whose women are trafficked and sold into China,” Shin wrote on his Facebook page. Fought from June 1950 to July 1953, the Korean War was frozen by an armistice between the US-led United Nations Command (UNC) on one side, and North Korean and Chinese forces on the other. As the conflict has never officially ended, a state of war still technically exists between the North and South Koreas. The DMZ along the armistice line is the world’s most heavily fortified frontier.